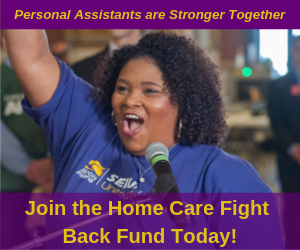 “On behalf of more than 53,000 state child care and home healthcare workers who have been under attack at the bargaining table by the radical demands of Bruce Rauner, SEIU Healthcare Illinois voices its strong support for House Bill 580, which would shield our vital workforce from historic overreach. “When Rauner successfully sabotaged Senate Bill 1229 with the help of Ken Dunkin, several legislators simply voted present because they felt both sides could make progress and such legislation wasn’t necessary. The intervening months have shown just how unreasonable Rauner can be. We need House Bill 580 now. “That’s because Rauner’s demands of our workers have been extreme and are without precedent. He is asking our workforce, the lowest paid in the state and a majority of whom are women and people of color, to be paid even less. To put this in context, by the state’s own data, licensed home child care providers make less than $5 per hour, after expenses. He would thrust them even deeper into poverty. Rauner also wants to strip our workers of health insurance and training. “It has been clear that Rauner wants an end to labor peace in Illinois: This bill would move to restore it. And passing this legislation would release some of Rauner’s many hostages and could add to the conditions for Illinois to finally move forward after this nightmare period of extremism, threats and bullying.